It has been a very bizarre and hectic day / week. Very. Most of the bizarreness was on Twitter - but the hecticness came from being in lots of difference places in a short space of time and juggling a lot. 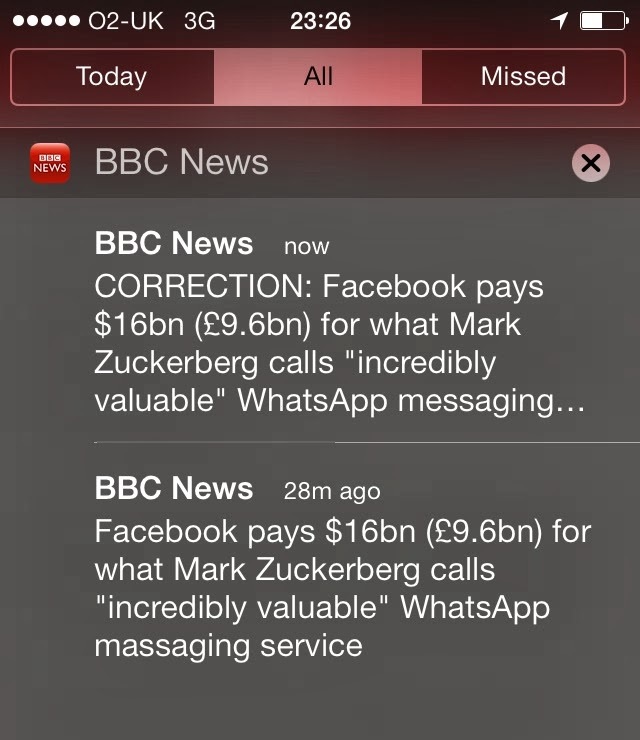 Firstly, I woke up to loads of Twitter notifications because Jeremy Vine shared the below photo I sent him of the massive spelling mistake by the BBC which changes the meaning of the sentence completely. Can you spot it? Very funny. I then managed to make huge progress with the results section of my dissertation - SPSS is SUCH a headache but thank heavens for Andy Field, his textbook and his YouTube videos. I also submitted an essay, which has been lingering on my TO DO list for far too long. THEN whilst on my four mile walk to go and buy a Cronut I had this Twitter correspondence with Ruby about her flies being undone in Cape Town - I am now on "fly alert" for her UK tour. I have just been to a fascinating talk by Prof. David Nutt about Drugs. Will post video when they make it available as it was recorded. He covered everything from alcohol to ecstasy to cocaine to heroine to parliament in a very short space of time and made it all so easy and bite size / rememberable. Such an interesting guy. All of that AND some very exciting email correspondence which can't be revealed yet but perhaps one day I'll be able to tell you. I must have been paying attention at some point on my travels today because I am almost 100% sure I spotted a member of the Royal Family - I won't say who or where exactly as I am not absolutely certain it was them but it may well have been. All of that and the worry about getting my dissertation and coursework done on time (don't panic - I am on target!) AND the endless question from everyone "What are you going to do when you leave university?" My answer is simple: Please give me some space, I am working on it whilst juggling a lot else at the moment and trying to have a social life, and finish my degree, which is, as it should be, my main focus at the moment. Because it will be easier to find a job with a degree. I've got the rest of my life to find a job and work. I've only got three months left at university - so let me focus on that for now - and enjoy the fun of being a student and being able to nip out and buy the odd Cronut now and then. I think I ought to change the title of this post to "Twitter, SPSS, Cronuts, Flies and David Nutt" Better summary of my day, no?